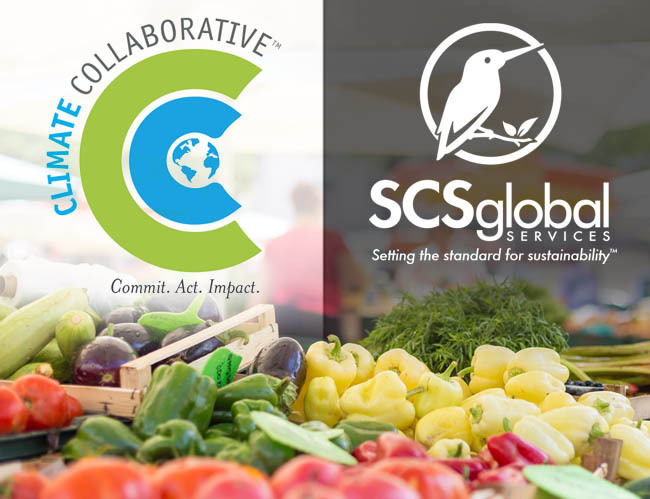 February 26, 2019 /3BL Media/ – The Climate Collaborative, a joint project of the Sustainable Food Trade Association (SFTA) and OSC2, is pleased to announce that SCS Global Services is now recognized as an official Solutions Provider partner. SCS is a leading international third-party certifier and standards developer, and a pioneer in the climate and sustainability arena. In its role as Solutions Provider, SCS will share its insights and support the efforts of the Climate Collaborative and its network of committed companies, an influential roster of climate-focused natural and organic food industry companies who are committed to undertaking bold action on behalf of climate and the environment. The Climate Collaborative provides a roadmap and resources for companies in the food and agriculture sector seeking to minimize their carbon footprints. Companies can make public commitments in action areas covering agricultural practices, energy efficiency, food waste, forests, packaging, policy, renewable energy, short-lived climate pollutants, and transportation. Since the collaborative was founded in 2017, 340+ companies have made over 1,300 specific climate commitments. In addition to sharing information with Climate Collaborative companies via webinars, articles, and other resources, SCS will be providing discounts on key climate and sustainability services, such as carbon footprint and neutrality certification, carbon offset verification, sustainability report assurance, water stewardship and zero waste verifications, Sustainably Grown® certification, USDA Organic certification, Non-GMO Project verification, and food safety training and certifications. About SCS. SCS Global Services is a global leader in third-party quality, environmental and sustainability veriﬁcation, certiﬁcation, auditing, testing, and standards development. Its programs span a cross-section of industries, recognizing achievements in green building, product manufacturing, food and agriculture, forestry, power generation, retail, and more. In addition to its Emeryville, California, headquarters operation, SCS has affiliate offices in Latin America, Asia/Pacific, Europe and Africa. Its broad network of auditors are experts in their fields, and the company is a trusted partner to many environmental NGOs and corporations due to its dedication to quality and professionalism. SCS is a chartered beneﬁt corporation, reﬂecting its commitment to socially and environmentally responsible business practices. Carbon offset verification: Christie-Pollet Young (cpollet-young@scsglobalservices.com) (510) 452-9093. About Climate Collaborative. The Climate Collaborative is a project of OSC2 and SFTA to catalyze bold climate action among natural products companies. The Climate Collaborative brings manufacturers, retailers, brokers, distributors, and suppliers together to build existing climate solutions to scale and to find innovative, new ways to help reverse climate change. Follow the Climate Collaborative on Facebook @climatecollab and on Twitter @ClimateColl.